A fireplace in any of your room is the one place that enlightens and highlights the entire space, not just with the roaring fire but also with the way you have decorated it. 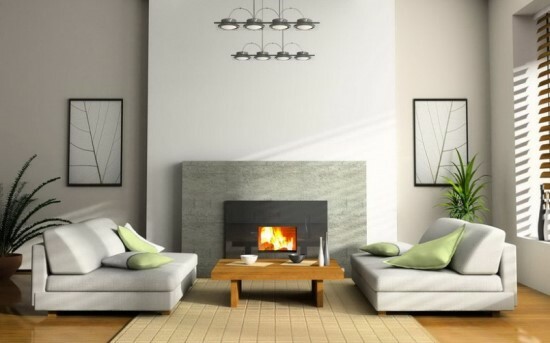 Generally, a fireplace occupies a greater portion of your room compared to other things. This gives you the opportunity to make your room an outstanding place, simply by applying a few ingenious fireplace decor ideas. When you will set out to find the best and most suitable fireplace décor for your home you might get baffled by the many ideas that people and other sources have to provide you with. We, by giving you some exceptional ideas, will try to make your job a bit simpler. Here are a few ideas for decorating your fireplace. 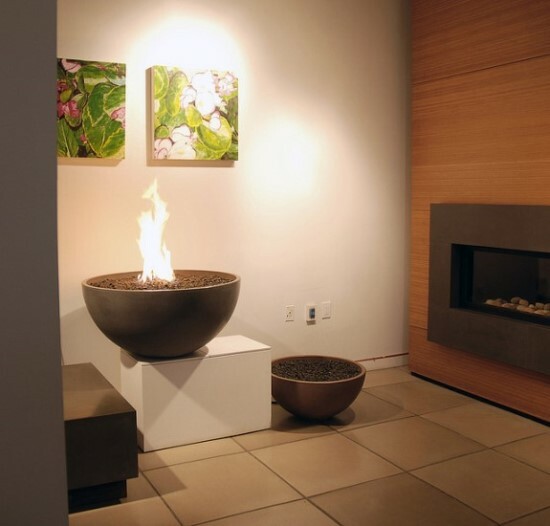 If you are looking for a completely unique and yet a contemporary look with your fireplace, the Fire Pit shown below is just the idea you need. An earthen pot with a burning fire will not only give a visual grace to your room but will also spread warmth in the room. Placed on a white wooden hearth gives it a perfectly unique and contemporary look. This fireplace gives an antique look to your living room, making it a favorite place for those who love a historic look. Adding to the antiquity of the look is the distressed fireplace mantel decor, based on this 19th century relics. This wood burning fireplace can be further highlighted by the two antique paintings on either side of the fireplace. When thinking of a fireplace for your dining room, you might want to consider this purely luxurious fireplace idea. This simple elegant fireplace with a cream painted surround, which suits best for dark wallpapers in your dining room. The raised fireplace allows every seated person to enjoy visual warmth coming from the gas fireplace. The mirrored panels that flank the fireplace add depth and dimension and also reflect light into the room. A fireplace with an old look always changes the ambiance of your room. 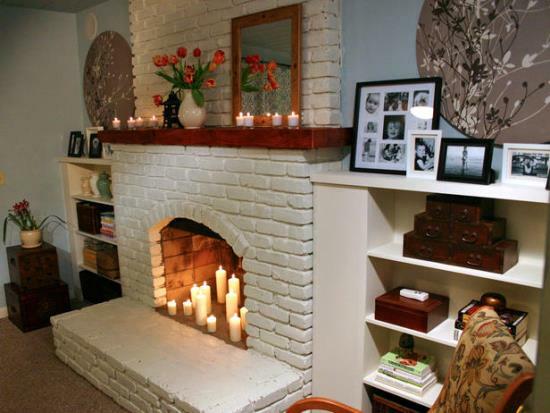 Try this painted brick fireplace and give your room a completely unique, mixed up look. Dated bricks covered up in a fresh paint of white, stretches up to the ceiling, highlighting the fireplace in your room. The wooden mantel decorated with candles and flower pots further enhances the beauty and décor of the fireplace. No matter what your room décor is, casual or traditional, the hearth shown in the picture below with a metal framework will surely accentuate the look of your room. Furthermore, you can be creative and have a fireplace mantel decor of sensible items that will jell along well with the general theme. 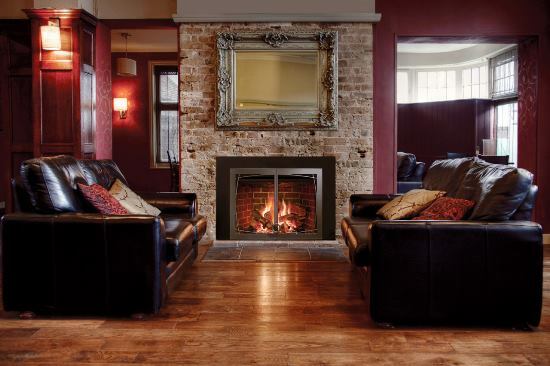 This brick fireplace, with the type of mirror you choose, can be used to either enhance your traditional or modern tastes. This simple yet elegant fireplace will reflect visual warmth into the room. A simple white surround adds to the simplicity and elegance of the fireplace. When looking for a classic look in monochrome, this fireplace idea will prove to be the best for you. The simple monochromatic color combination enhances the elegance of this fireplace design. A wooden mantel that stretches both sides with the fireplace in center gives it a contemporary edge. The fireplace with traditional bead board panels only adds texture to the fireplace. 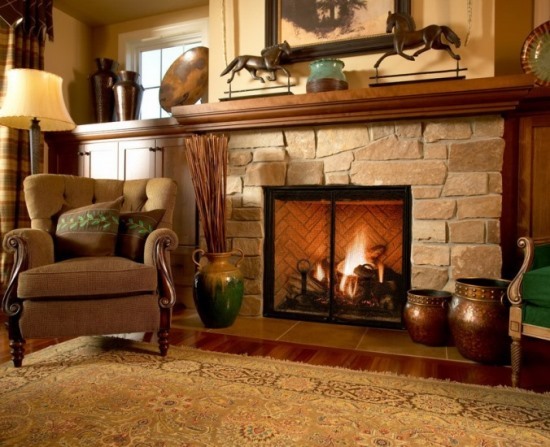 Having a chimney wall is not really necessary as seen in the fireplace shown below. This traditional hearth with a white surrounding can simply be placed against an adventurous wallpaper that accentuates the focal point in your room. In the fireplace design displayed below, a classy fireplace with white surrounding is built against a background of cast concrete tiles. This simple yet elegant fireplace idea creates a classic focal point in your room. 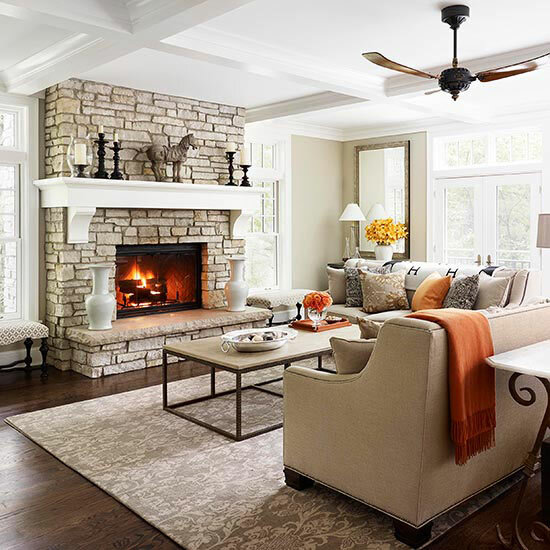 This brown stone fireplace suits well with the surrounding brown atmosphere it is set in. The fireplace mantel décor consisting of a wall painting and statues adds glamor to your rustic hearth. Adding the safety factor is the protective gate. With the surround of grey marble tiles, this fireplace idea gives a quite classy and contemporary look to your living room. 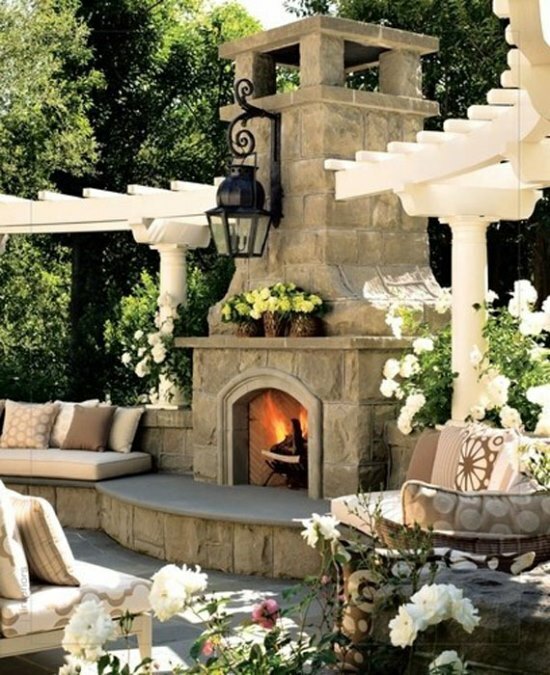 When sitting out in the courtyard with your friends on a cold night, a stone fireplace sets a perfect ambiance. Decorating the mantel with flower plants only enhances your experience of a courtyard party. This living room fireplace with white surround and entire cabinet makes up a classy focal point in your home. 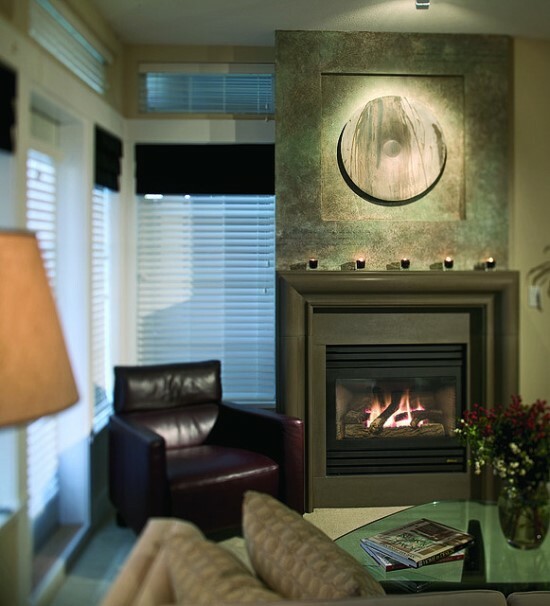 This stone fireplace with an elevated mantel adds a contemporary and classy look to your room. The stony background extending up to the ceiling also adds to the contemporary look of the fireplace. This fireplace will become your living room’s natural anchor point when it comes to furniture arrangement because of the built-in storage units. The black surround poses a strike contrast to the light storage unit shade giving it a classy look. The charcoal gray and black stone background running all the way up to your ceiling displays a dramatic look and accentuates the vertical. 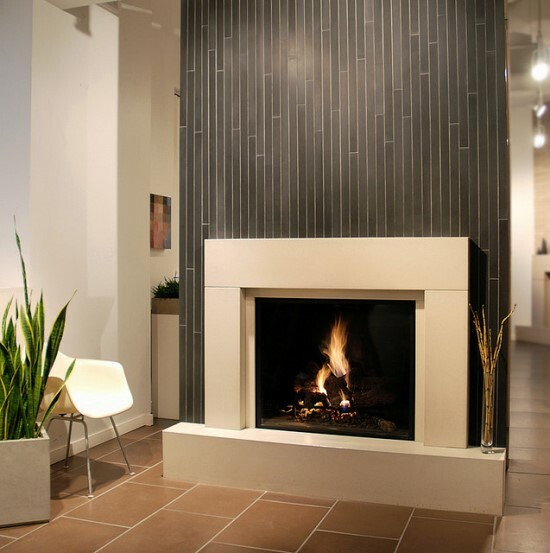 The stone background only helps in desensitizing the typical black box of the gas fireplace. 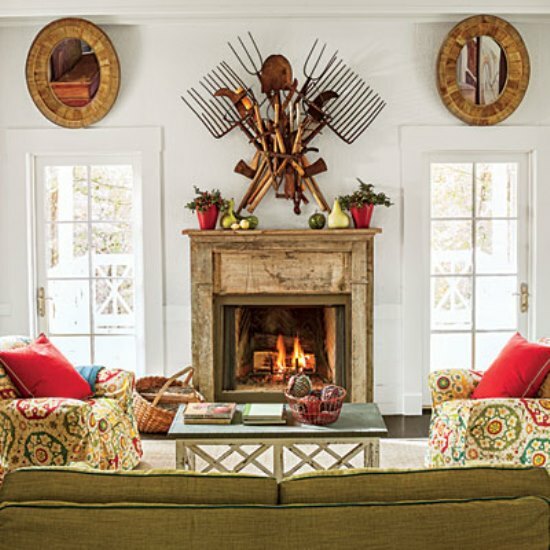 This traditional décor and a steel framed hearth will give an eclectic look to your living room. The brick background makes a rustic presence in the room, giving it a classy ambiance. 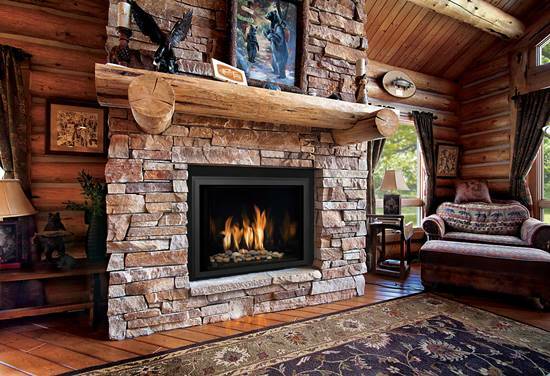 The unevenly shaped stone wall framing the black box hearth gives an elegantly rustic edge to your living room. The wooden mantel topped with wooden decorative further enhances the rustic look. 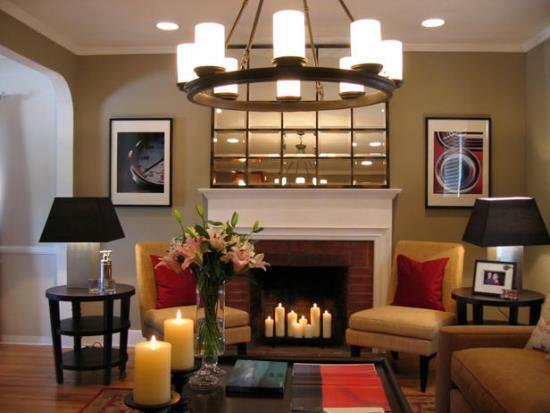 As said, fireplaces make up an important part of your interior designing. Hence, if you are looking for refurbishing your home, these inspirational fireplace décor ideas may definitely help your cause.